In the face of pervading poverty and corruption, football fans are experiencing extreme cognitive dissonance during this year’s World Cup in Brazil. Many international fans seem aware of FIFA’s shady and corrupt history and the Brazilian government’s lack of conduct regarding its impoverished citizens, but the concept of boycotting this year’s World Cup is still quite out of reach. You would think FIFA, a global governing body for football, would have some ethics but some of FIFA’s officials have had no problem taking bribes when considering countries bids to host the world cup, while also clinging to the notion that they are a part of a proud not for profit organisation. The Australian government is even considering suing FIFA, alleging corruption over its lost bid to host the 2022 world cup. FIFA has also received criticism over the years for coercing nations who host the World Cup to implement unethical laws including tax exemptions for FIFA and its sponsors, and laws that can potentially help to harm the citizens of a hosting country. Brazil, upon the insistence of FIFA, has temporarily removed its ban on alcohol (a ban which was implemented because of the high death rate caused by alcohol) inside stadiums to make room for Budweiser beer to be sold at the World Cup. FIFA’s current president, Sepp Blatter, also has a not so clean image within the organisation. Among other scandals, in 2004 Sepp Blatter made remarks that women football players should wear tighter shorts and lower cut shirts if they want to improve women’s football. Aside from FIFA, the Brazilian government’s conduct throughout the World Cup hasn’t been the best either. 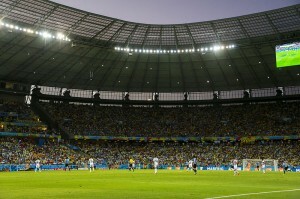 A Brazilian government commissioned study has suggested that Brazil will see economic growth thanks to the World Cup. However, the economic benefits for Brazil, even in light of the World Cup, are debatable. Many economists state that Brazil’s economic growth will be much smaller than the $11 billion that has been spent getting ready for the World Cup and inflation is more likely anticipated. This is due, in part, to FIFA’s demands for upgraded infrastructure and internal security. Protests have been ongoing in Brazil since June 2013. In particular, demonstrators have protested Brazil’s spending of public money on the FIFA World Cup, saying that public money should be used to improve things like health, education and security in deprived areas and shantytowns. Many protestors believe that money is being spent frivolously on corruption, and unnecessary stadiums. Forceful evictions of shantytowns and other poverty stricken areas have also taken place to beautify the hosting cities and make way for tourists. This is nothing new though in the World Cup’s history. During the 2010 Word Cup in South Africa, widespread forcible evictions took place in hosting cities’ slums to improve South Africa’s image. Child prostitution too is set to rise with the country’s influx in tourism. Prostitution is legal for those over the age of 18 in Brazil, but approximately half a million children are currently engaged in child prostitution work. “These girls come from extreme poverty, a culture of social exclusion and a tradition of profound disrespect for women,” a state prosecutor has told CNN. The Brazilian government has put roughly $3.3 million (a feeble amount of money when contrasted against what has been spent on hosting the Word cup) into preventing child prostitution in Brazil’s host cities. Yet these attempts to stop child prostitution have been criticised as a ploy to push the problem out of sight and not address the problem at its roots while also cleaning up Brazil’s image. Setting aside the action on the pitch we must ask: is the quelling of poverty-stricken masses, the exploitation of government power and spending and the careless and corrupt behaviour of FIFA and the Brazilian government all worth a game of football? This entry was posted in Sport, World and tagged FIFA 2014, News, sport, world. Bookmark the permalink.